Is there anything quite so wonderful as dirt? My son has loved the stuff since he was old enough to toddle out to it. Back in those days, he’d throw it in the air, and scuff through it. When he began talking, he explained the kicking and throwing was to “make smoke.” He’s never tired of watching the patterns that dirt makes in the air. Well, it’s one thing to have a preschooler play in the dirt. 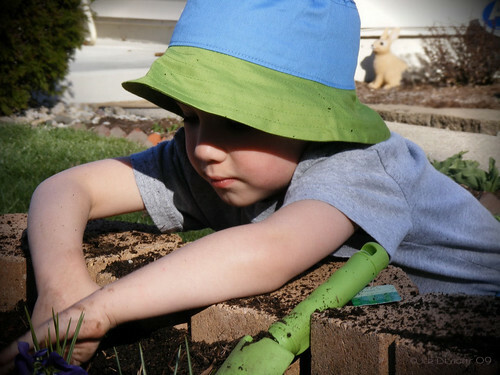 After all, they are little and having fun, but what do you do when your dirt-loving children grow up and really should be inside learning like other respectable youngsters? Hopefully, you’ll silence the urge to speak out and let them go play in the stuff! One day, I discovered he was not only digging, but adding water. Gee, did he have to play in the mud? He was making such a mess! I was not only thinking about missed worksheet time or other ways I could impart knowledge, but I was also thinking LAUNDRY! Oh, how I wanted to call him in, but I refrained that day. He was busy for hours, contentedly playing alone on a beautiful sunny day. Before he came in, he invited me to come take a look at the “Snake River.” We’d been reading about the Lewis and Clark expedition, and he was following up on parts that had interested him with this mud play. He wasn’t merely playing. Due to an aversion to muddy laundry, combined with a sincere interest in teaching my child, I had almost stopped some true learning. It was a close call. Another time, he made adobe bricks, using his own recipe. Once again, he was following up on a story. He pulled out some scrap wood and managed to independently build a rough form and then filled it with his mud concoction. He had a few failures, and worked on improving his recipe. We had hard bricks all over the yard for awhile. He also tried digging to the center of the earth once. That’s pretty typical kid stuff, and he gave it a good try. There was quite a hole in the back yard! In typical homeschool fashion, he didn’t stop there – he wanted to read more about the core of the earth to learn how deep his hole would have to be. And, he wanted to look at the globe to determine if China was indeed where he’d end up (no it wasn’t). Another huge project took months of dedicated earth moving, and the final product had extended paths for the flow of water. Yes, water again, and he used a lot of it for this project. And yes, I had to refrain from asking him not to “waste” water. He was trying to figure out different ways water can move, what happens to the surroundings, and how one can change the flow with barriers. It looked like some erosion experimentation had been going on too. After awhile he made a little wooden boat to sail down. I imagine he now knows much more about water flow, dams, and erosion than if I’d introduced a formal science experiment, or read from a book. Then there was the “loafing” incident. He was just kind of kicking around. Clearly loafing – the kind of loafing that can make a parent think of the bedroom that needs cleaning, or the weeds that need pulling. He explained later that he was drawing math problems in the dirt. He had read that Archemedes used to do that, and he wanted to see how well it worked. Given that he was going through a less-than-eager math phase, this was indeed interesting information. There’s nothing quite like kid’s play. It’s worth standing back and allowing a child plenty of unstructured time to learn on his own, without adult intervention. And in our household, the medium of choice is often good, old, readily available . . . dirt. From an article originally published in The California Homeschool Guide in 2001. Years later, the little boy who was always playing in the dirt and building things earned a degree in molecular and cell biology at UC Berkeley, and is currently a neuroscience grad student at UCSF. Written by Karen Taylor, posted on 30 December 2012 at 11:30 am, and filed under Gifted, Learning Ideas, New homeschoolers, Unschooling. Bookmark the permalink.